Conan Exiles is coming to Xbox One in the second half of 2017. Will it successfully stand out witth all the survival adventure games in the picture? The title shares the same engine, gameplay mechanics, and genre with ARK Survival Evolved, for instance, so let’s see if there’s anything new the game is going to bring on the table in this world of crafting and survivalism. Conan Exiles is set in the fictional world of Conan the Barbarian. Age of Conan was launched in 2008 and the game is still enjoying updates even now, 10 years after its release. You can currently find Conan Exiles in Early Access on Steam. In Conan Exiles, you’ll find survival very familiar if you have previously played ARK: Survival Evolved. The game allows a large amount of visual customization to build a barbarian just the way you desire, and you’re provided with some great-looking character options that perfectly suit the Conan world. The game’s universe awaits you and after you’ve finished building your character, you find yourself freed from crucifixion by Conan himself and then dumped into a vast desert. Combat in Conan Exiles consists only of clicking, unfortunately. You only have to click on your enemies and they’ll explode into rivers of gore and blood. So, the combat is a bit basic as you’ll be able to see for yourself. On the other hand, the monsters are awesome: giant spiders, eldritch beasts, even hyenas and gazelles – they all create a world abundant in biodiversity. The game’s construction engine is awesome and might be the most rewarding element of Conan Exiles. You can practically build anything anywhere as long as it’s not on someone else’s structure. You can even build up on top of rocky pillars and on the sides of mountains! The game has a rudimentary religion system that allows clans to worship various gods. If they’re provided enough offerings, they’ll help you sack enemy settlements. The system looks extremely promising even if it’s currently in its infancy. 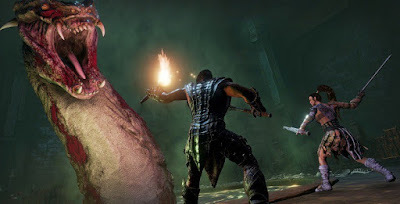 Funcom has promised some future improvements of the game, and they include the following areas: avatar defense, sorcery system, farming systems, “The Purge” NPC raids, new biomes and more monsters, dungeons and new features. Follow the upcoming news on Conan Exiles as the game has a lot of potential. You can now find the game on Early Access on Steam for $29,99 and on the Xbox One in just a few months’ time.